Online favor shop for affordable wedding favours, photo wedding favours and wedding bonbonniere. We custom make bonbonniere and also stock major wedding favour brands to ensure your wedding is everthing you dream of! Beautiful bonbonniere and cheap wedding favours for sale online at Little Dance. Simply choose your preferred favors or bonbonniere from our range and select the bonbonniere or favours option in the shopping area! Need inspiration? Visit our main page for pictures of our party range! Sweets and candy - jelly beans, lollipops, chocolate beans, rock candy. Hoping to save money, or perhaps make some cheap bonbonniere? Not a problem. There still might be some buying involved, but by buying bonbonniere supplies in bulk, direct, you can put them together yourselves and save a packet. Sweets and lollies are a great idea, perhaps combined with some of our mason jars that we sell online. We can even design some cute labels to go on them. Or maybe a custom lip balm, enhanced with your wedding design and special message. 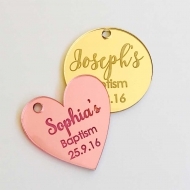 We can help you to make your own wedding favours, with many items for sale online in Australia on this website. Sounds like you? We can help. A huge part of our wedding supplies range is produced with you in mind. From the basics, such as jelly beans and chocolate beans for wedding candy buffets, to more elaborate personalised wedding bonbonniere. These include custom chocolate bars, with your message and theme, as well as personalised lollipops. Affordable, practical, and all for sale online. Theme your wedding stationery to match. Many weddings have a central theme, with design elements carried across the entire theme. We can help with this including with wedding stationery and decorations. We create affordable wedding invitations, with matching personalised stationery, favours, banners and wedding lolly buffet supplies. The one design and the same colours can be used on your whole order of wedding supplies, and look stunning.